Claire Burns of Wilmington was the second singles champion in the Wilmington Invitational tennis tournament. 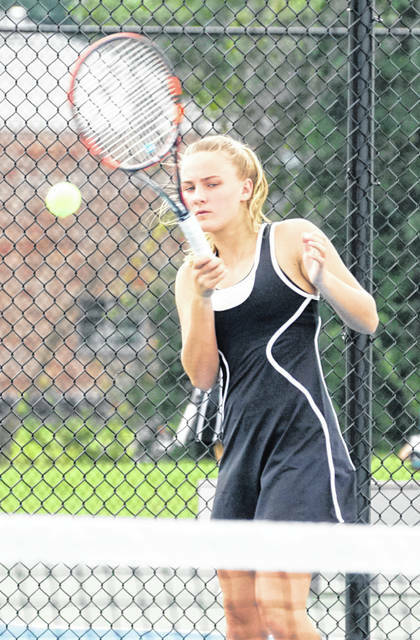 WILMINGTON – Claire Burns won the second singles title and the Wilmington High School tennis team finished as runnersup Sunday in the Wilmington Invitational tennis tournament. The tournament was suspended Saturday because of inclement weather. It resumed Sunday and finished with Columbus St. Francis DeSales winning the overall team title. DeSales was a fill-in following one team dropping out. “When a team pulled out at the last minute, and we’d recently been rained out against DeSales, I’m glad it worked out,” WHS coach Doug Cooper said. Wilmington finished with 30 points while Kings had 29 and Washington 28. Burns won three matches en route to the second singles bracket championship. “Claire is playing with a lot of confidence right now,” Cooper said. • Claire Burns def Noyes (LM) 8-0; def Arbona (DeSales) 6-, 6-0; def Gostel (K) 6-1, 6-2. Finished first. • Rachel Barker def Adois (LM) 8-6; was def by Leithauser (DeSales) 2-6, 0-6; was def by Bowers (Leb) 3-6, 2-6. Finished third. • Emma Schroeder, Jenna Taylor def Thalheimer, Kendle (WC) 8-2; def Osborne, Semblie (Leb) 6-0, 6-2; were def by Murphy, Ballard (DeSales) 2-6, 3-6. Finished second. • Kristina Walt, Zane Bekheet def Wisecup, Hogsett (MT) 8-3; were def by Wilcox, Draminsai (DeSales) 2-6, 2-6; were def by Manwalirs, Chin (Leb) 4-6, 4-6. Finished fourth.